If there’s one common criticism of big MPVs, it’s that they don’t have enough space in the third row. The Citroën SpaceTourer addresses that, with plenty of head- and legroom in the back, if fitted with the optional third row of seats. What’s more, tick the box on the order form for the extra bench and there’s space for eight people rather than the more usual seven. 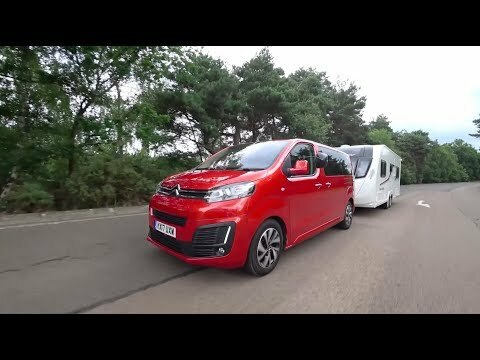 But what we want to know is what tow car ability this MPV offers caravanners. It’s big, but is the SpaceTourer also clever? The Citroën SpaceTourer measures nearly five metres from nose to tail, yet the manufacturer quotes a fairly modest kerbweight – we’ve added 75kg for the driver, giving a 1672kg total. The braked towing limit is 2300kg, although if the car is fully loaded, the effective towing limit drops to 1900kg. We matched the Citroën to a Swift Expression 646 with a Mass in Running Order of 1453kg. That is an 87% match, slightly above the 85% usually recommended, but the SpaceTourer coped well with a tourer of this weight. With 273lb ft of torque, the 2.0-litre diesel has enough grunt to tow the Swift caravan from 30-60mph in 13.7 seconds. On hilly roads the Citroën comfortably holds speed, so long as you’re willing to work the six-speed gearbox. Overtaking needs a long straight, but the performance is there if the engine doesn’t drop far below the 2000rpm torque peak. The SpaceTourer confidently handled a hill start on a 1-in-10 slope. The handbrake held the outfit still, and with a little effort to balance clutch and throttle the Citroën towed to the top of the hill without fuss. In most conditions, the SpaceTourer is a stable tug – in fact, it surprised us in the lane-change test. Lethargic steering didn’t inspire confidence, but the Citroën stayed firmly in charge with almost no pushing from the caravan. Its long wheelbase contributes to a sense of security when changing direction. In calm conditions, the SpaceTourer feels serene at speed – in a strong crosswind the outfit moves a little, but not enough to alarm. Whatever the wind is doing, there’s some pitching on bumpy roads: it doesn’t have the finesse and control of a Ford Galaxy or a Seat Alhambra, for example. However, these are relatively minor complaints. Overall, the Citroën makes a decent tow car. So, we know what tow car ability it has, but what about in everyday life, without a caravan hitched to it? It would be unfair to expect a big, van-based MPV such as this to be as fun to drive as a VW Touran or Ford S-Max. But despite being based on a commercial vehicle, the SpaceTourer is easy to live with. So long as you get on with its sheer size, that is. It’s very long and wide, so demands care on narrow lanes or around town. The light steering helps when manoeuvring, but the stiffly sprung clutch takes some getting used to. Rear parking sensors are standard, though some may feel that upgrading to front sensors (£480) is money well spent. On the open road, the slight pitching motion we noticed when towing is evident, but otherwise the Citroën is fairly comfortable. It’s not as quiet as a Touran, but not so noisy that we’d baulk at the prospect of a long drive. If you think the Citroën SpaceTourer is ‘just a van with windows’, it should exceed your expectations. Here is the reason people choose cars like this – it’s huge inside. The third row is a £1080 optional extra on Feel spec, but standard in the costlier Flair, and it makes the SpaceTourer an eight-seater. The bench slides back and forth on runners, folds, and can be removed. The same is true of the second row, and both have three sets of ISOFIX child seat mounts. With the third row in place and fully back, there’s more head- and legroom than you’d find in just about any other MPV. Accessing the third row is less of a scramble than in many rivals, thanks to the sliding doors and the facility to move the middle bench forward out of the way. The second row has more than enough legroom, while also leaving space for adults in the back. And there are air vents in the ceiling, plus separate air-con controls to keep everyone at a comfortable temperature. Up front, there’s plenty of headroom but modest legroom. However, our 6ft 3in driver was able to get fairly comfortable. For lots of luggage space without removing seats, the backs of the rear benches can be folded. That should be enough space for most needs, but to complete its van impression, you can take the seats out. The Citroën’s £32,570 price-tag is around £600 more than a Ford Galaxy 2.0 TDCi Titanium. So it’s no bargain. But it offers a lot more space, an extra seat, plus standard climate control, a 7in touchscreen, Bluetooth, a DAB radio, two 12V sockets, sliding rear doors, and automatic lights and windscreen wipers. The official economy figure of 53.3mpg compares reasonably to the Galaxy 2.0 TDCi’s 56.5mpg. We saw 26.1mpg while towing. Most buyers will be better off with a more conventional MPV, but if you really need a spacious third row then the Citroën SpaceTourer has a lot going for it.